File this under “while you were on summer vacation.” The Newberry Library released a fascinating photo collection under the deceptively plain title “Daily Life Along the Chicago, Burlington and Quincy Railroad.” It is a selection of some 3,000 black and white photographs taken by Russell Lee and Esther Bubley in 1948. Both Lee and Bubley are more well known for their role in the New Deal Farm Security Administration photo collections, much of which is available online. In this case they were promoting a folksy identity for fairly large corporation with deep roots in the Midwest, rather than reform of the American political economy. A handful of these pictures were published in the volume Granger Country, written and compiled by then Newberry Library president Stanley Pargelis and Chicago newspaperman Lloyd Lewis. The rest languished in the stacks of the Newberry until a few years ago when Newberry archivist Martha Briggs, librarian Hjordis Halvorson, and others secured funding to scan a selection. The CB&Q collections makes for an interesting companion to the much larger Charles Cushman collection at Indian University (14,000 color slides by an amateur photographer). It is much more focused, as you would expect from two professional photographers who were escorted around the railway system by Pargelis and CB&Q PR employees. There are series of “daily life” shots that focus on particular towns, workshops, and farms. One series documents life on a family farm in north central Illinois, including a trip to Chicago by the farm wife (on the CB&Q, of course) to shop at Marshall Field’s. A good number of the shots have a formulaic feel of corporate publicity, but there are some real gems, too. I’m struck by the image above, of two women rail shop workers in Havelock, Nebraska. What a story these two must have. Their body language suggests the bonds of women working in an intensely male environment–likely as not the only women on the shop floor. 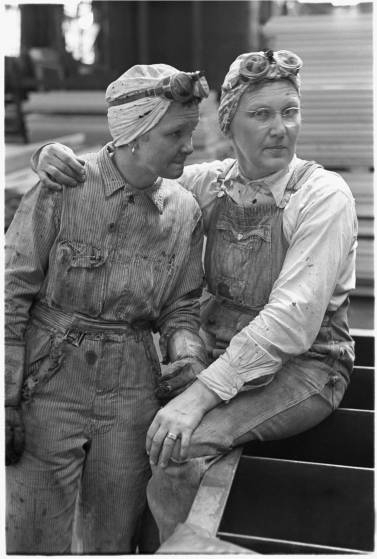 Were these two “Rosie the Riveters” who held on to their wartime jobs? The woman who looks into the camera is wearing a wedding ring. Is her husband working there too? Unemployed? Gone? The collection is also rich in describing the work processes of a large railroad at a moment when rail travel was still quite common. There are quite a few shots documenting work in roundhouses, loading and unloading freight and passengers, and cleaning passenger trains. 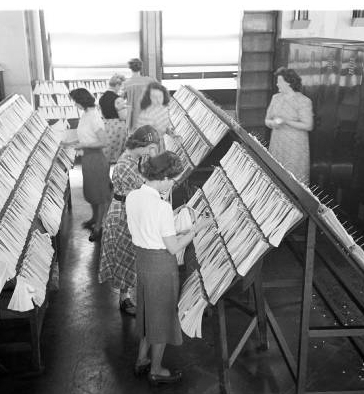 There are also a few shots of the pre-computer information technologies used by railways to set freight rates (agent with rate books and a phone), and keep track of individual train cars across their sprawling continental networks. Like the Cushman collection, the CB&Q collection documents a peculiar moment in U.S. history. Historian Eric Sandweiss writes that Cushman’s images captured a landscape and built environment frozen in time by the Great Depression. Among other things, the Depression ground to a halt the massive construction boom of the 1920s. True, the New Deal would sponsor a wide array of public works including housing and roads. But compared to the phenomenal growth of the post-World War II period, the 1930s saw relatively little in the way of urban transformation, and much of the building during the war was temporary housing. So the immediate postwar years are interesting in that they retained much of the feeling of scarcity held over from depression and war. The take-off was still just over the horizon. Unfortunately, the collection is housed within CONTENTdm in such a way that makes it impossible to easily integrate into blog posts. No doubt this is to protect the Library’s intellectual property. But if any of my old colleagues at the Newberry are reading, you can see that it’s easy enough to grab a low-res image from the site. So why not facilitate blog integration? Put the images up on Flickr? Similarly, to save image links in Delicious or Zotero, you have to go and grab a separate “reference link” by clicking on a nearly-hidden link at the bottom left of the images catalog page. On the plus side, CONTENTdm provides a way to save your “favorites.” But for me, I’m more interested in saving my favorites centrally, along with my other citations. Despite these gripes, I’m thrilled that this collection is out, and I salute the Newberry librarians and archivists who worked hard to preserve it, catalog it, and made it accessible. This entry was posted in Document, History and tagged archives, Chicago, Esther Bubley, Newberry Library, photographs, Russell Lee. Bookmark the permalink. Thanks so much for following up, Toby. Sorry it’s taken me a while to respond. In addition to having a download and print page for each digital object, we may include some code for ease of social network-type sharing (Facebook, Twitter, Digg, Stumbleupon, Delicious, e.g.) and perhaps a couple of the more popular blogging products – Blogger, WordPress. Not sure if this will make the cut or not, given that it does take some extra code work, and upkeep – for example, I heard a rumor that delicious might be going away? Anyway – now that I read your posts again, I’m not sure this is even the kind of thing you were after. Initially, when I read that you wanted an easy way to add an image to your blog, the social network-type sharing came to mind, but perhaps I misunderstood, and all you are really after is a better way to grab an image, other than “right click -> save image as.” In any case, I think our download feature will make it pretty easy for teachers to include images in lecture, students in presentations, etc. I’ve found it interesting work with a home grown digital assets management system like ours and an out of the box product like ContentDM. Given the array of interface options out there, I can see why it would be frustrating for scholars/teachers/researchers to have some options available on some sites, and not on others. The perils of living in a time of transition, I suppose. We’ll just have to keep the communication lines open so that software companies and libraries will continue to develop products that are useful to the users out there. For this, I so appreciate you speaking up! Hope you had a nice holiday season, happy new year!